Oli commenting from the previous post suggests its a bit Academy Awards meets Mastercard, I tend to agree..
And whats with the sign in the background saying “I told you so”? (screen capture below). The “I Told You So” is a reference to something former Socceroo Johnny Warren once said about Footbal in Australia, that after promoting the game down here for all of his life that he wanted his legacy to be “I told you so” when the game finally broke through in Australia. It’s somewhat of a catch-cry in Australian football now. wanna hear something horrible? one of our private channels here in colombia stole this ident graphics (look, i am seeying them right now on the tv!). And they thought no one would notice this because the graphics are from the other side of the world LOL. Hey Melissa, these ident graphics are the official graphics from the world cup, if your television station does not want to do them by themself, they get these graphics. even the worldcup homepage uses them. so no theft of graphics. the only station i know which has its own, is the bbc. Melissa i don’t think one of the private channels in Colombia stole the ident graphics from SBS, as Univision Deportes, ABC Sports and ESPN; here in the U.S sometimes use the same graphics before the game begins or during the half time of the game, i think this Ident its beign broadcasted from the IBC in Germany, and what channel is it you’re talking about? is it Caracol or RCN? ‘cos i thought i saw Caracol sometime ago using the 2002 world cup theme compossed by Vangelis almost 50 days before the 2006 world cup. ohh…I had no idea about that…thanks guys. thanks again, everyone for the info. 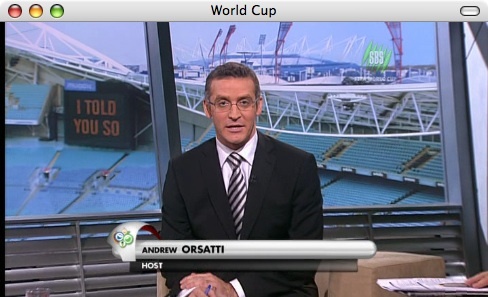 Does anyone know where you can find the official 2006 world cup graphics and fonts used on SBS and host broadcaster?